A last ball six from Rohit Sharma changed the fortune of the game as Mumbai Indians beat Deccan Chargers in a nail biter in the IPL 2012. Deccan Chargers scored 138 runs with one wicket still in hand after 20 overs and the Mumbai Indians trounced 142 for the loss of five wickets on the last ball of the metered over. The master blaster, Rohit Sharma, was declared ‘Player of the match’ for his extraordinary knock of unbeaten 73 off 50 balls. 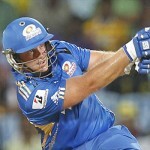 The 9th match of the Indian Premier League 2012 was played at Dr.Y. S. Rajasekhara Reddy ACA-VDCA Cricket Stadium, Visakhapatnam on April 9, 2012 and a full house enjoyed the thrilling encounter. Earlier, the skipper of Deccan Chargers, Kumar Sangakkara, won the toss and opted to bat on a fine looking batting track. The decision bounced back instantly as they lost two quick wickets for just 9 runs in 3.1 overs and the team was under tremendous pressure. Shikhar Dhawan and Daniel Christain put their heads down and took the initiative back from the Mumbai Indian bowlers. The first preferred to attack and sent the ball flying out of the fence in the fourth and fifth over and followed by 17 runs in the next over with two sixes and one four. He tried to carry on but lost his wicket for 41 off 24 balls with 4 sixes and 2 fours as the second wicket was gone at 46 runs. Christian took over the charge as Sangakkara provided some assistance and they added 36 runs for the fourth wicket when the latter was bowled by Munaf Patel for 14. Cameron White came in next and joined with Christian as the tempo of the game was carried on since both batsmen posted a six in the 14th and 15th overs. White followed with another six in the next over and the score was enhanced to 123 when Daniel Christian was caught by Kerion Pollard off Patel for 39 scored on 36 deliveries with two sixes and one four. White became the lone fighter and remained unbeaten on 30 off 22 deliveries with 2 sixes and one four as Deccan Chargers managed 138 runs for the loss of 9 wickets in 20 overs. Munaf Patel was the star performer and grabbed four wickets, Lasith Malinga held three as Kieron Pollard got two wickets. Mumbai Indians lost their openers for just 10 runs in four overs when Rohit Sharma and Ambati Rayudu stopped the invasion of the rival bowlers. Sharma dispatched 11 runs in the sixth over which included one six and a four as Rayudu kept on creeping at the other end. They shared 48 runs for the third wicket as Rayudu became the next victim for 19 runs. Kieron Pollard dropped in next, the flow of runs was enhanced instantly and especially the first smashed three sixes in the even overs. The duo took the score to 95 in 16.2 overs when Pollard was caught at deepish mid-off by Dhawan off Christian for 24 from 18 balls with three well timed sixes. Mumbai Indians required 37 from the last three overs which looked like a demanding job when Rohit Sharma came into his own and punched two sixes in the 18th over. Deccan Chargers came back in the match as Dale Steyn bowled the 19th over, gave away mere five runs and claimed a wicket of Dinesh Karthik . James Franklin came in the centre as Mumbai Indians needed 18 runs from the last over which was bowled by Daniel Christian. Franklin powered the first ball for a four while directing that to the long-off boundary and got two runs on the next ball. He took a single on the third ball as Sharma smashed the fourth ball over point boundary for a six and reduced the deficit to three by stealing two runs on the fifth ball. The last ball from Christian was sailed over long-on for a six by Saharma and the victory was snatched out of the jaws of Deccan Chargers. Sharma remained unbeaten for 73 off 50 balls with 5 giant sixes and 4 fours as Mumbai Indians achieved the target by thrashing 142 runs with five wickets still in hand. Dale Steyn was the highest wicket taker with three whereas Daniel Christian and Amit Mishra shared one wicket each. Mumbai Indians won the scintillating match by a good margin of five wickets, secured two points and took their tally to four whereas Deccan Chargers have lost both of their games played so far.